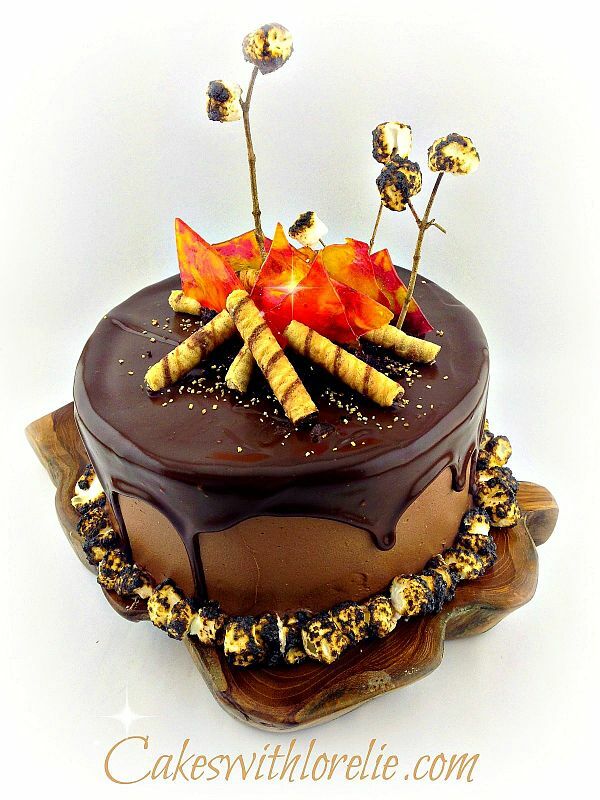 The campfire cake design lends itself beautifully to an open fire pit birthday celebration. 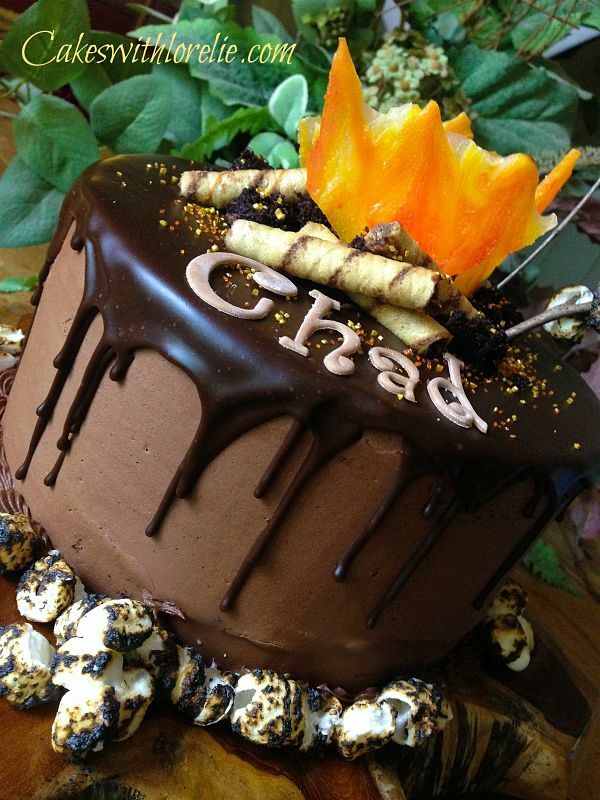 This fun cake design was for our son Chad who recently turned 29 years old. Almost as old as my cake business!!! This is a pretty straightforward easy cake to make. The only element that took some doing was the candy fire. My first two attempts were done using a mixture of sugar and water, boiling it to 300 degrees Fahrenheit, swirling red and yellow food coloring in and pouring it onto a piece of waxed paper on a cookie sheet. There is an easier way to do this and you will see that demonstrated in the video below. NOTE: I recommend the vanilla cake a.k.a. my White Wedding Cake Recipe here on the website. I discovered through trial and error that the lighter flavor of vanilla worked best with the rich chocolate filling and icing. The caramel flavor didn't shine through the way I had hoped with the buttermilk chocolate recipe. The battery operated lights are great for bringing the flames to life. I tried a real candle and it wasn't quite bright enough. So when you decorate this make sure to leave room enough to place one of these inside. The video shows a close up. 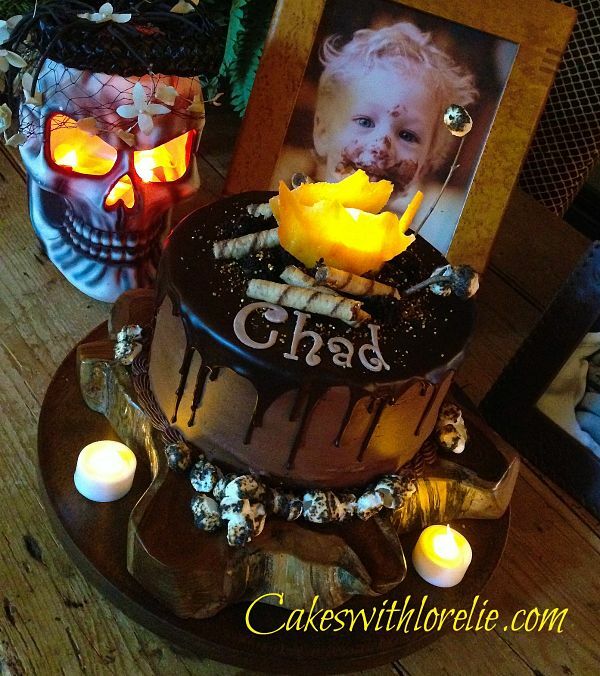 We often do a Halloween theme around Chad's birthday since it is mid October. The skeleton was added to the setting and his famous chocolate smash cake face photograph makes it's yearly debut. In the video you will see how to make the candy flames and how the design was put together. I learned by trial and error what the best flavor combination is and how to simplify the process of making the flames. Often times a pretty plate or stand inspires me. If you have been following my site for a while you know that I am a bargain hunter. Try as I may, the woman who was selling the polished Teak wood would not come down on her price of $30.00. It was too perfect for this rustic cake, I had to have it. You can find wood pieces at craft shops and even at places like Home Goods now for less. This led me to the idea of a fire pit celebration complete with roasted marshmallows and our son singing his latest song and playing his NEW guitar.